If your cruise ship is mooring at the Marittima basin, a hotel near the Piazza San Marco is worth considering. Rates tend to be considerably higher in San Marco than in other districts of Venice, but the major sights and shops are close by, and the Alilaguna airport boat's Blue Line offers service from Arsenale, San Zaccaria, and San Marco to the Terminal Crociere (cruise terminal) at Marittima. Along the way, it stops at Zattere, which is handy if you prefer a hotel in Eastern Dorsoduro. The Luna Baglioni (5 stars) is friendlier and more intimate than many luxury hotels, with a very helpful concierge. The Luna Baglioni is Venice's oldest hotel (the Knights of Templar slept on the site in 1118), and its ballroom-like breakfast room is a sight to behold. Europa & Regina (5 stars) is a highly regarded Westin property that occupies five buildings along the Grand Canal. The more expensive double rooms have partial canal views. The Bauer Palazzo (5 stars) consists of two sections: the Hotel Bauer, a 20th Century luxury wing, and Il Palazzo, an historic palace facing the Brand Canal. Accommodations range from well-equipped double and twin rooms to exclusive (and expensive) suites. The Bauer Palazzo has a highly-rated restaurant, the De Pisis, and a café with a terrace where breakfast is served in good weather. Monaco and Grand Canal (4 stars) is just a short walk from the Alilaguna airport boat's pier. 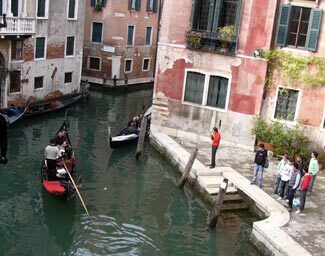 The hotel occupies a 17th Century building on a splendid site where the Grand Canal feeds into St. Mark's Basin. Moving down in price, we come to the Anastasia (3 stars), which has single and double rooms for prices that are quite reasonable for this part of town. The Casanova (photo at right), the Firenze, and the Torino (all 3-star hotels) are also convenient to the airport boat and the Piazza San Marco. The very reasonably priced Mercurio (2 stars) is just west of the square. The San Moisè (3 stars, photo at left) is about five minutes from the boat platform, on a quiet street near the Hotel Kette (4 stars). We're fond of both hotels, but the San Moisè might be a better choice during the warmer months because it has a courtyard with tables. It's also less expensive than the Kette. Other three-star hotels close by include the Violino d'Oro, the Lisbona, the Bel Sito & Berlino, the highly-regarded Flora with its garden, and--for opera lovers--La Fenice et des Artistes. The Saturnia & International (4 stars, photo at right), the very popular Ala (3 stars), and the inexpensive Locanda Fiorita (1 star) are also in good locations.